I’m positively giddy! I eagerly look forward to my new planner/calendar each year, probably more than the average person. I was thrilled to find a slightly different design last year which made a big difference in my perspective. It’s still a work in progress, but frankly, we all need an organizational system unique for us. 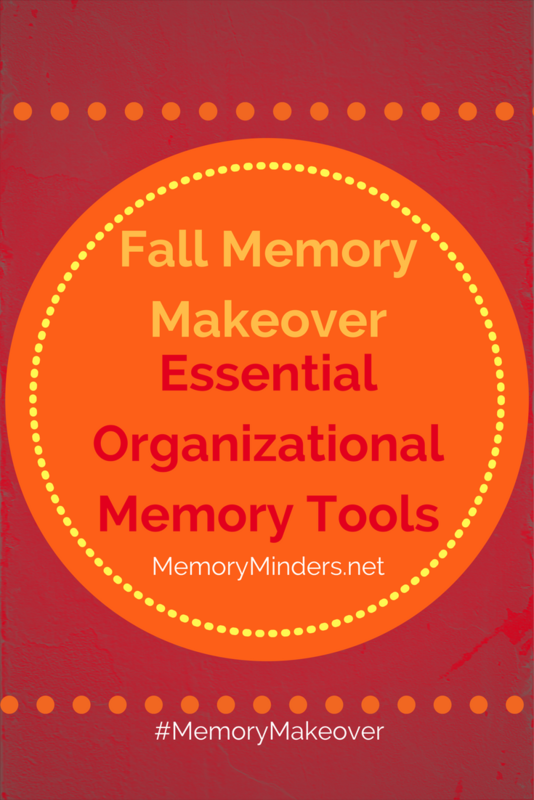 Continuing our #MemoryMakeover theme of organization this month, I firmly believe everyone can benefit from a system to keep track of our physical and mental minutia. It doesn’t matter if we tend to be naturally organized or not, the more organized we become the more it helps both our physical and mental space. While not everyone finds joy in organizational planners like I do, my love of planning gives me insight on some tangible tools to help anyone interested in becoming more purposeful in organization. Calendar-Use one or more and pick what you like, but make sure it’s big enough to write things down if utilizing a paper version. Often, small pocket calendars don’t have room to write more than one thing for each day, which isn’t helpful. I so love planning, I’m guilty of having too many calendars! The key to multiple calendars, one with you and one at home, for example, is to make sure each matches the other to avoid confusion. Calendars range from simple, paper versions to incredibly complex electronic variations. Use what works and is comfortable for you and then keep them synchronized. To Do List-Once you have a calendar, make a to-do list based off what’s on the calendar. Some make giant lists (I used to) then feel ineffective if everything doesn’t get crossed off. The list should only be as long as realistically can be accomplished in the time available. Make them as detailed as desired: hourly, daily, weekly, monthly or yearly, just be realistic. Things can always be added off a larger or ‘project’ list. The key is to keep it helpful, simple and achievable. Planner-These beauties often combine a calendar with a larger to-do list. Some use this as a global place for big or general ideas then make smaller variations of to-do lists or calendars off of it. The key again is to keep it concise and make sure to not create multiples of the same information in various places. Make it work for your style, your life. Paper & Pen &/or Electronic Notes-We all need to write things down as we age to remember well. But if we’re not organized and prepared, we may forget the info before we can write it down! This is why paper & pen or electronic note applications should be easily accessible at all times. Then, we’re ready to jot down notes, things to remember, grocery items, names, appointments, ideas for the future, books we want to read, party plans–the list is virtually endless! It’s important to transfer the information if necessary to where it’s appropriate-calendar, files, to-do list, etc. to be most useful. But none of this can happen if we aren’t organized enough to have it available when needed. Files/Binders/Boxes– Lastly, a larger system which can adapt as needed is necessary for paper, electronic and bulkier items. An online, cloud and/or digital system can be utilized for electronic files. I use regular binders and files and three different versions of electronic storage and am just scratching the surface of the potential usefulness of them all. Again, the key is simplicity and ease for your style. Try some and don’t be afraid to scrap one system if it doesn’t seem to work for you. This is especially true over time when we all adapt to either growing or downsizing in various areas of our lives. It may seem overly simple or not the best use of our time to organize, but trust me it is. Organization provides structure to our days and a backup for our memory. It allows us to sharpen the saw toward improved efficiency and quality of life. These tangible tools are useful for everyone yet we each take a different approach to how we use them. Next week we’ll discuss some general ‘how to’ tips for organizing our mental and physical space and specifically using these tools listed. Assess your tangible organizational systems currently in use. Are they working for you? Would adding any of the above essentials help and if so, which one would be best to begin with? As always, let me know how your #MemoryMakeover is going or if you have any questions or comments. Let’s get organized to enhance our physical and mental space to ultimately make more memorable moments!